A late Jewish work, never received into the Jewish canon, and included in the Apocrypha by Protestants, although it was pronounced canonical by the Council of Carthage (397) and the Council of Trent (1546). It takes its name from the central figure, called Τωβείτ (Τωβείτ, Τωβείθ) in Greek, and Ṭobi ( ) in a late Hebrew manuscript. The story of the book is as follows: Tobit, a pious man of the tribe of Naphtali, who remained faithful to Jerusalem when his tribe fell away to Jeroboam's cult of the bull, was carried captive to Nineveh in the time of Enemessar (Shalmaneser), King of Assyria. There, together with his wife, Anna, and his son Tobias, he gave alms to the needy, and buried the outcast bodies of the slain, keeping himself pure, moreover, from the food of the Gentiles. He was in favor with the king, however, and so prosperous that he was able to deposit ten talents of silver in trust with a friend in Media. With the accession of Sennacherib (the successor of Enemessar) the situation changed. Accused of burying the dead slain by the king, he had to flee, and his property was confiscated; but when Sarchedonus (Esarhaddon) came to the throne Tobit was allowed to return to Nineveh at the intercession of his nephew Achiacharus (Aḥiḳar), the king's chancellor. Here he continued his works of mercy; but, accidentally losing his eyesight, he fell into great poverty, so that in his dire distress he prayed that he might die. On that same day a similar prayer was offered by Sarah, the daughter of Raguel of Ecbatana (in Media), in despair because she had been married to seven husbands who had each been slain by a demon on the wedding night. The same day Tobit, remembering his deposit of money in Media, determined to send his son for it. A companion and guide (who turns out to be the angel Raphael) being found for him, the two proceeded on their journey. At the river Tigris, Tobit caught a fish and was instructed by his companion to preserve its heart, liver, and gall. Conducted to Raguel's house, he asked Sarah's hand in marriage, drove away the demon by burning the heart and liver of the fish in the bridal chamber, sent Raphael (whose assumed name was Azarias) for the money, and returned, with him and Sarah, to Nineveh, where Tobit's eyesight was restored by smearing his eyes with the fish's gall. Father, mother, and son reached a good old age (Tobias living to rejoice over the destruction of Nineveh), and died in peace. This brief outline does not do justice to the artistic construction of the story, or to the fine touches in its descriptions of family life, social customs, and individual experiences. It may be reckoned among the most delightful of short stories. The text exists in Greek, Latin, Syriac, and Judæo-Aramaic, besides two late Hebrew translations. Of the Greek there are three versions: one given in the Vatican and Alexandrian manuscripts of the Septuagint; one in the Sinaitic; and one in Codices 44, 106, 107 of Holmes and Parsons. Of the Latin there are two recensions: the Old Latin, which agrees substantially with the Sinaitic Septuagint; and the Vulgate, made by Jerome from an Aramaic text, which often agrees with it, although it presents many divergencies. The Syriac follows the Vatican in general, although it is by no means lit-eral, while Codices 44, 106, 107 agree sometimes with this text, sometimes with that of the Sinaitic. The Aramaic text (published by Neubauer) also represents the Sinaitic recension in a general way, but is late, and can scarcely be considered the descendant of Jerome's original. The Hebrew copies are late and of no authority. 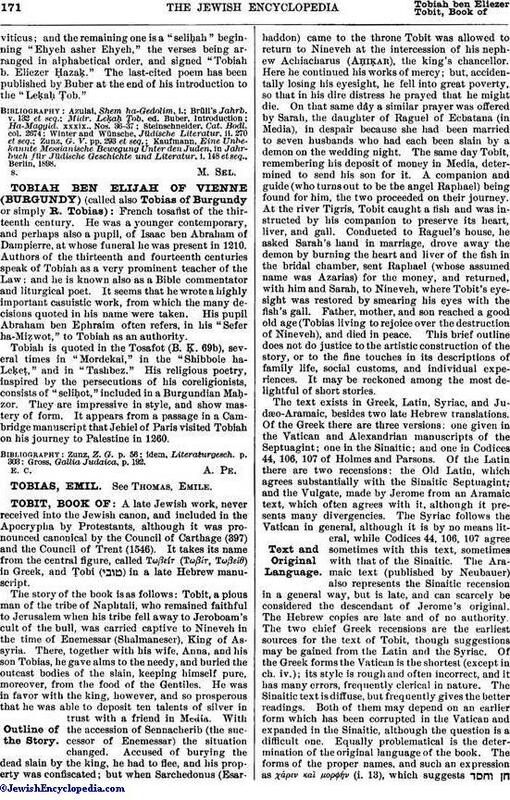 The two chief Greek recensions are the earliest sources for the text of Tobit, though suggestions may be gained from the Latin and the Syriac. Of the Greek forms the Vatican is the shortest (except in ch. iv. ); its style is rough and often incorrect, and it has many errors, frequently clerical in nature. The Sinaitic text is diffuse, but frequently gives the better readings. Both of them may depend on an earlier form which has been corrupted in the Vatican and expanded in the Sinaitic, although the question is a difficult one. Equally problematical is the determination of the original language of the book. The forms of the proper names, and such an expression as χάριν καὶ μορφήν (i. 13), which suggests (Esth. ii. 17), may be held to point to Hebrew, as may also the type of piety portrayed, although it must be noted that there is no mention in early times of a Hebrew text, which Jerome would doubtless have used had he known of its existence. The Sinaitic forms "Ather" for "Asur" (xiv. 4) and "Athoureias" for "Asureias" (xiv. 15), on the other hand, are Aramaic. The excellent Greek style of the Sinaitic may suggest a Greek original. In view of the conflicting character of the data, it is best to reserve opinion as to the original language; the text appears to have suffered a number of revisions and misreadings. 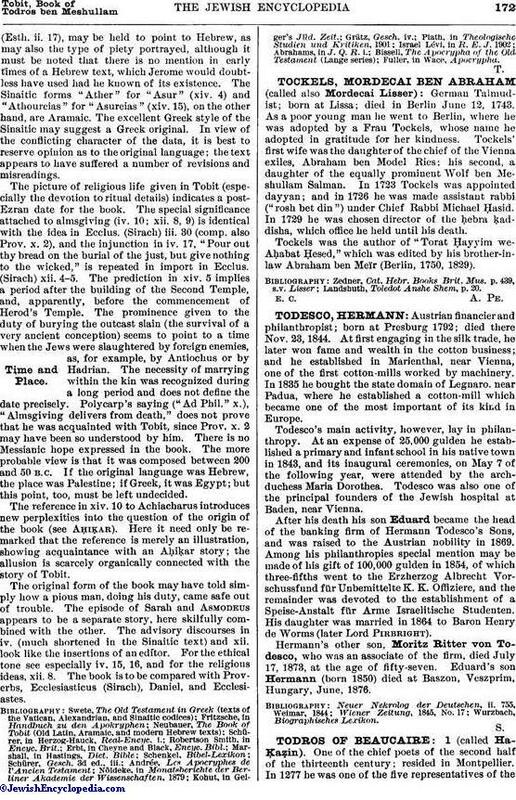 The picture of religious life given in Tobit (especially the devotion to ritual details) indicates a post-Ezran date for the book. The special significance attached to almsgiving (iv. 10; xii. 8, 9) is identical with the idea in Ecclus. (Sirach) iii. 30 (comp. also Prov. x. 2), and the injunction in iv. 17, "Pour out thy bread on the burial of the just, but give nothing to the wicked," is repeated in import in Ecclus. (Sirach) xii. 4-5. The prediction in xiv. 5 implies a period after the building of the Second Temple, and, apparently, before the commencement of Herod's Temple. The prominence given to the duty of burying the outcast slain (the survival of a very ancient conception) seems to point to a time when the Jews were slaughtered by foreign enemies, as, for example, by Antiochus or by Hadrian. The necessity of marrying within the kin was recognized during a long period and does not define the date precisely. Polycarp's saying ("Ad Phil." x. ), "Almsgiving delivers from death," does not prove that he was acquainted with Tobit, since Prov. x. 2 may have been so understood by him. There is no Messianic hope expressed in the book. The more probable view is that it was composed between 200 and 50 B.C. If the original language was Hebrew, the place was Palestine; if Greek, it was Egypt; but this point, too, must be left undecided. The reference in xiv. 10 to Achiacharus introduces new perplexities into the question of the origin of the book (see Aḥiḳar). Here it need only be remarked that the reference is merely an illustration, showing acquaintance with an Aḥiḳar story; the allusion is scarcely organically connected with the story of Tobit. The original form of the book may have told simply how a pious man, doing his duty, came safe out of trouble. The episode of Sarah and Asmodeus appears to be a separate story, here skilfully combined with the other. The advisory discourses in iv. (much shortened in the Sinaitic text) and xii. look like the insertions of an editor. For the ethical tone see especially iv. 15, 16, and for the religious ideas, xii. 8. The book is to be compared with Proverbs, Ecclesiasticus (Sirach), Daniel, and Ecclesiastes.